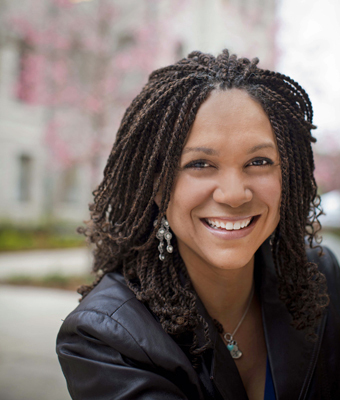 MELISSA HARRIS-PERRY burst onto the political media scene back in 2008 when she began making regular appearances on The Rachel Maddow Show. 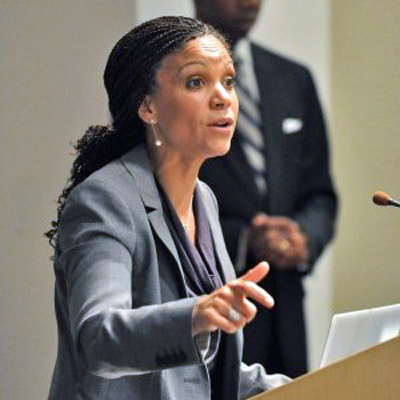 At the time, Melissa was a political science professor at Princeton, but she quickly proved herself as a rigorous thinker with a knack for concise political and cultural analysis. A media star was born. Free of superfluous nonsense, Melissa is on a mission to educate. A professor at Tulane University with her own academic center, Melissa has written two books, she pens a column for The Nation, she engages her Twitter followers daily and, in her spare time, she coaches her daughter’s soccer team. 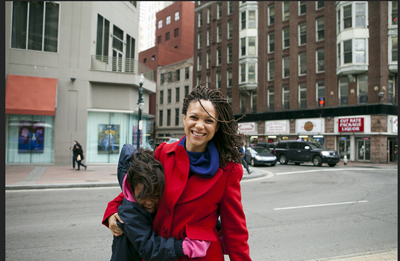 Starting this month, Melissa will expand her reach even further with the debut of her weekend show on MSNBC. Last week I sat down with a tape recorder and a few notes to talk with Melissa about her new book, her new life as a journalist and the importance of planning tea parties with your girlfriends. 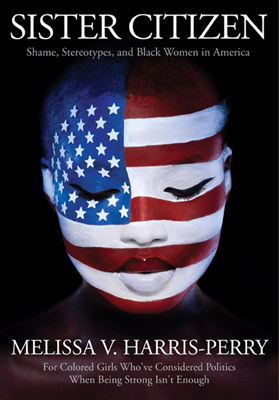 In Sister Citizen you address the African American female experience and the negative stereotypes placed on us by today’s society. With so many of us moving forward in ways our mothers and grandmothers could have only imagined, why haven’t we been able to dismantle the antiquated rhetoric and unflattering caricatures? It’s about maintaining power for those that have it. I often have audiences ask me, ‘What can we, as black women, do to get rid of the Jezebel myth?’ So, the easy answer would be, if you stop participating in hip hop videos and don’t have children out of wedlock then you will show that you are not a Jezebel. So, you feel it’s out of our control? Yes, but I don’t see it as depressing. The idea that black women are hyper sexual breeders emerges in slavery. But the idea that we were making sexual choices in the context of slavery is sufficiently nuts, right? It was not because of anything that black women who are slaves are doing that created that. So, the focus is not whether or not the sources of power think that we are Jezebels or Mammies, it’s whether or not we become so twisted by the knowledge that those stereotypes exist that we find ourselves unable to move forward in our authentic selves. Women in my family believe that what I have to deal with compared to them, well there’s no comparison and the fact that we’ve expanded our horizons to a much greater extent is a source of accomplishment for them, so I don’t want to feel that it’s out of our control, like there’s nothing we can do. The first lady is a good example of this, right? Can you think of anyone who is less angry than Michelle Obama? Shouldn’t she be a lot more angry than she is? My girlfriends and I talk about this all the time. 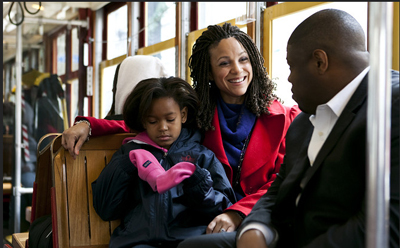 In 2008, the media’s perceptions of Michelle and her life took us a bit by surprise. The fact that Michelle was smart, happily married, lived well, loved fashion and ate healthy was reported like she was a rarity, but to us she was like any girlfriend we knew. Maybe because we are post-civil rights babies we thought we were past beliefs that we are somehow not mainstream in our concerns and interests. The First Lady recently addressed a stereotype in your book–the angry black woman. Were you surprised that she went there and named the stereotype the way she did? I was a little surprised only in that the first lady has been extremely careful to rarely be defensive about anything and both of the Obamas tend to shrug off criticism and refocus the agenda on things that matter. I wasn’t surprised for two reasons and I’ve thought a lot about Shirley Sherrod and the way she responded to the attacks on her and the fact is her response was significantly more effective than Van Jones’ response to the critiques about him. So, maybe the Obamas learned a bit from Shirley’s willingness to step out there, name it, push back against it and move on. The other reason why I was less surprised, and I don’t know for certain because I am not an insider by any stretch of the imagination, but there may have been a sense of betrayal given that Kantor had inside access. And not that the story would have needed to be more positive, or rosy, or glowing. When I read Kantor’s book, I don’t read it in precisely the ways the first lady seems to have, I see the article in the New York Times as being more stereotypical than the book itself. So, Kantor’s Times excerpt didn’t do her book justice? Well, it did it some justice. Let me be clear, I didn’t really like the book, but I don’t find it quite as over the top as the New York Times article. In other words, I think the book is more complex, more focused on other kinds of things and the article was a weird piece to pull out because there are a lot of other things going on in the book. The other thing is, I’m teaching a course on first ladies right now and most of what Kantor says about Michelle Obama within historical context is actually par for the course. It could easily describe Edith Wilson or Jackie Kennedy and there is almost no first lady that does not behave in these ways. So, maybe that was the sense of betrayal, if Kantor had placed this in a referential point where she says that Michelle Obama is a lot less aggressive than Hillary Clinton or Nancy Reagan then all of a sudden you get a different perspective. When the first lady, who is black, is presented in this way without the historical context of her white counterparts, it’s very easy to see it as part of her racial personality rather than seeing it as how first ladies since the 1910s have behaved. Hurricane Katrina figures prominently in Sister Citizen, and having grown up on the Coast, I was in a perpetual state of disbelief during Katrina’s aftermath, but I’m still reconciling your idea that Katrina was somehow a flashpoint for understanding African American women as citizens and survivors. What about other tragedies and injustices where African American women were front row center? It’s not that one is more or less significant, but what makes Katrina unique and there are really only two modern American disasters where this is true, where we were able to suffer as a country in real time with our fellow citizens. First September 11, when we watched the towers come down together and the experience of being together as a nation, not watching it later on the news, but co-suffering, not experiencing it in the way the survivors and victims experienced it, but having a real time visual and visceral connection to it, is part of why the policies in the decade following 9/11 went the way they did. It’s part of the reason why the country got behind the Patriot Act, the invasion of Iraq and the bombing of Afghanistan. 9/11 was a real trauma, not only for the people experiencing it, but for all Americans watching it and feeling that sense of solidarity. And 9/11 data shows there is very little difference in how blacks, whites, men, women, Democrats and Republicans experienced 9/11. Fast forward to August 2005, again we get a real time American disaster in an iconic American city and we are watching for days as the flood waters rise, we see that people are suffering, and we are getting all of that in blanket wall-to-wall coverage, but the response was not a sense of overwhelming American solidarity and the policy responses following Katrina are not a sense of this horrible thing happened, it feels like it happened to me too, we have to get in there and take whatever policy steps are required. Instead the response was quite different and we see enormous gaps in race, ideology and region, but it was primarily race in how people responded to Katrina. Blacks responded with the same feelings as 9/11, but white Americans almost not at all. 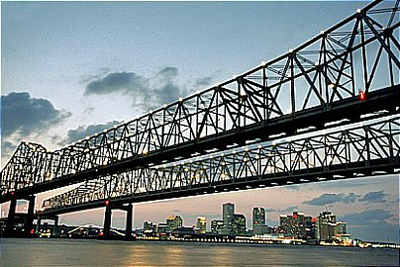 So, what makes Katrina unique is not so much that it’s the most important thing, but like 9/11 it provided us with a way of saying that when we see our fellow Americans suffering it is happening to me too, but that didn’t happen during Katrina and why is that? I believe it was because Katrina gets framed primarily in black bodies and most specifically black women’s bodies. When you were denied full professorship at Princeton, you were quoted as saying that not receiving the professorship felt like a failure, now with the show on MSNBC are you considering that God had bigger plans for you? I never thought that I was a failure, but that was a failure in my life. Nothing will ever change the fact that I wanted to be a full professor at Princeton and it was not because I definitely wanted to stay because I had my eye on Tulane and moving to New Orleans, but I was tenured and I wanted my colleagues to look at my work and say that they thought I was worthy of taking that last step of promotion and they looked at my work and said, ‘No, sorry, we just don’t think it’s good enough’. But would they trade places with you now? MSNBC has given you a much bigger classroom. I see these as separate parts of my life. I went from being a tenured professor at Princeton to being a full professor at Tulane with my own academic center and if I’d never gotten the MSNBC show I didn’t need any vindication. With the television show, I’m not giving up being a college professor, or living in New Orleans, and I still see my primary identity as that. I’m very clear that television shows tend to last one to five years and I don’t have any idea if enough people in this country want to listen to me talk for two hours on the weekend about politics. So, most of the eggs in my ego basket are still in my professorial basket. The conversation you referred to was about failing, and it was more that I think it’s really easy for us to look at people with outward success and forget that all success always includes very painful failures. I’m married to my second husband, James and he is my soul mate and he is the best thing that ever happened to me in terms of another human relationship. My daughter is extraordinary, but she’s her own person and, you know, in ten years she’ll move out of the house to live her life. James is my life partner and I could have never met or married James if I had not divorced my first husband. But do I look at my first marriage and see failure, absolutely. When I got married it was with the intention of a lifetime of marriage and joy and failures, but we would be together. So, it didn’t make me feel like a failure, but I see that my path to marriage now walked through failure. I want young women to know that you can not get hung up on perfection because anybody that you look up to has been through failure and some will be honest about their failures and others won’t, but failure is true. When you were on UP with Chris Hayes recently I noticed that you looked a bit nervous every time Chris mentioned your new show. Being a TV host I don’t know what that is, maybe it will be fine, but my whole adult life I’ve been preparing to be a college professor, this TV thing happened over the past couple of years. Now that you’re officially a journalist, what can you learn from Oprah? Oh, that’s interesting. She very much learned over time to own the bigness of the thing that is Oprah. She is comfortable with being Oprah and learned to use it, not just for her own gain, but to promote other people, so I suppose if there is anything to learn from Oprah, it would be to own yourself. The TV hosts that I respect the most seem to have a strong and unshakable sense of self and core. Many describe you as self-assured, so where does that confidence come from? Was there someone who pushed you forward? If there is one person who does a lot of encouraging, it is my best friend, Blair. People who follow me on Twitter know a bit about my relationship with Blair because we tweet a lot. We went to grad school together, she’s a history professor at North Carolina State and she is the person who very early on in our relationship was my biggest cheerleader. Blair has always pushed me to do things that I find scary and, at one time, she literally had a cheer that she would do on the phone if I was on my way to a job talk. She helped me see my strengths. She’s very clear-eyed and can be quite critical, like when I first started doing TV, she called me and said, ‘Don’t wear that color again’. She’s really been all things to me. She’s saved my life more than once. As a professor, author, TV host, wife and mom, how do you create balance in your life? Many days I don’t feel balanced. On any given day, I’m doing great at my job but sucking at being a parent, or I’m hanging with my family and the emails are piling up, so part of it is that the balance is on the long horizon not the day-to-day. You can’t do everything everyday, so you have to take the long view. And I never attempt to do everything on my own. When I first found out about the TV show, I knew that I wanted to still teach, so the first thing I did was hire a teaching assistant to split the grading. After my divorce, when I was a single parent living in Princeton, I asked my mom to retire and move in with me and just last week I was in a panic because the apartment we rented in New York was not furnished and I didn’t have a bed, a towel, a dish, nothing, so James flew up and bought everything we needed. I don’t try to do it by myself. I always ask for help. What is your dream for yourself? My friend Blair and I have this vision for ourselves…we call it our tea drinking life. We wake up in the morning and we must live in a house on a mountain or beach because we can walk out on our deck, sit down, read a book and drink tea before we start our day. We’re both in the throws of parenting young kids and being professors right now, but that’s the dream. One day our lives will be in a place where everyday starts with tea on our front porch. I don’t know if it will be in our 50s or 70s, it’s hard to imagine, but there is a tea drinking life I’m going for, it isn’t about money for me, it’s about drinking some tea. Now that you’ve written two books, if asked to write your memoirs, what would the title be? Now you’re in my core pain, Yolanda because I don’t have a title for my TV show yet and you are stomping on my core pain! I can’t imagine writing my memoirs with my parents still living, I have too many stories to tell that they don’t know about yet. © Zavvi Rodaine.com 2012. No part of this interview may be used or reproduced in any manner without the express written consent of the Editor of Zavvi Rodaine.com. I have seen Melissa on several shows over the years and was always impressed with her perspective. Your mixture of openness and preparation brought out the true humbleness and honesty that makes her extraordinary. It`s a gift of rarity to get someone to open up to you. I was grasping for more … talk about taking it to another level, wow. Your talents are immense, you need a larger platform. Best! Wow, thank you for that. You made my day! I’m so excited about miniMHP as Dr. Perry called it. I love, love to listen to Dr. Perry’s analysis. It is Princeton’s loss and the world’s gain. We need MHP on the air because she is so amazing at deconstructing the crazy happening in our political discourse. One of the things I really love about MSNBC is that their journalists and experts are intelligent. They don’t dumb it down. Their analysis encourages reading but more importantly critical thinking. Once again, I am so excited we got MHP instead of Princeton. We need her much, much more than Princeton.